This year’s Albert Szent-Györgyi Doctors’ Award ceremony, to which more than 700 doctors were nominated by patients, has met an unanticipated success. Established in 2017 by Goodwill Pharma Foundation for Health, Albert Szent-Györgyi Doctors’ Award honours doctors in Hungary who have been remarkable in their profession and have demonstrated an outstanding empathy when treating patients. 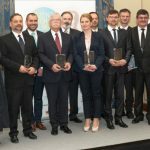 The ceremony was held on April 11, 2019, in Budapest at the Hungarian Academy of Sciences. Health is the most important in everyone’s life, therefore a large number of patients all over the country nominated their doctors for the award. They regarded the nomination as a form of expressing gratitude for the doctors for whom they could thank their recovery. Seven awards were offered based on patients’ nominations. Apart from the patients’ nominations, two professional awards were granted by the Foundation itself. The members of the commitee were Prof. Péter Klivényi M.D., and Árpád Kallai M.D. (Director of Csongrád County Health Centre Hódmezővásárhely – Makó) as well as the preeminent Hungarian actor Géza D. Hegedűs. The scope of Goodwill Pharma Foundation for Health is to raise awareness to the significance of doctors’ professionalism when it comes to the nation’s health. It is a symbolic expression of respect towards doctors and all health care professionals. It is equally important to ensure the training and teaching of young colleagues as qualified professionals are needed for our children and grandchildren as well. Albert Szent-Györgyi Doctors’ Award serves as a reinforcement and hopefully a new zest regarding the future. Marcia Szent-Györgyi, the widow of Albert Szent-Györgyi thanked all the doctors for their enthusiasm with which they have worked throughout the year and to the many patients who with their votes showed their commitment to their doctors. With admiration and gratitude – can be read on the grave of Albert Szent-Györgyi. Since Goodwill Pharma’s everyday work is also characterised by admiration and gratitude, these two are the main forces for supporting this award. On the one hand, the patients who have voted have expressed admiration for their doctors. On the other hand, we regard the work of Albert Szent-Györgyi with admiration. Albert Szent-Györgyi Doctors’ Award is a symbol of gratitude. Next year the award will be extended for health care professionals since we believe that their work matters as well. Förhécz Zsolt, M.D., internist, cardiologist, Semmelweis University III. Petlyánszki Gábor, M.D., general practitioner, Head of department, Szabolcs-Szatmár-Bereg County Police Health Department.